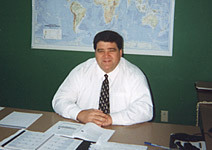 Anton has held executive positions over the past 25 years with Port Jersey Logistics, McLean Trucking Co., and Conrail. He brings a strong background in various modes of transportation, intermodal services, and warehousing. He has a M.B.A. in Logistics Management from Syracuse University and a B.A. in Economics from Middlebury College.